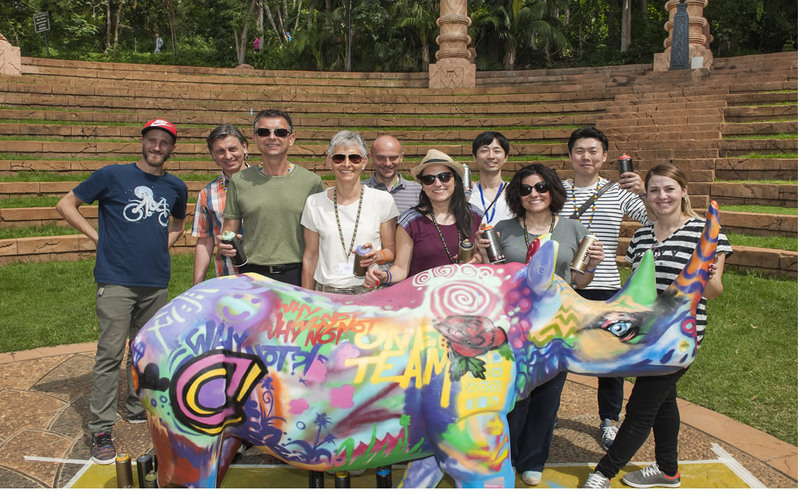 On the 4th April 2018, BAZ-ART was fortunate to host a graffiti art workshop for a team building of a corporate company. The workshop was orientated around the collective effort of all human beings concerning the conservation of endangered animals. 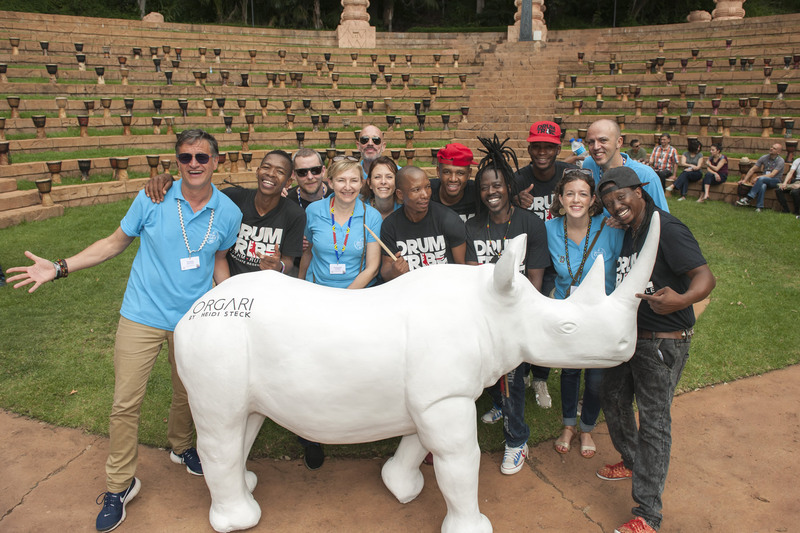 The Sweet-tooth duo, Page33 and Zesta, facilitated the workshop with about 20 participants on a live size ornamental fibre glass rhino. Sweet-tooth is based in Johannesburg and their style as a unit encompasses a mix of both their personalities and varied art forms. Together, their passion for creating murals stems from the impact public art has on the emotions and behaviour of those who experience it. Their efforts were to educate and raise awareness concerning the importance of protecting animals. 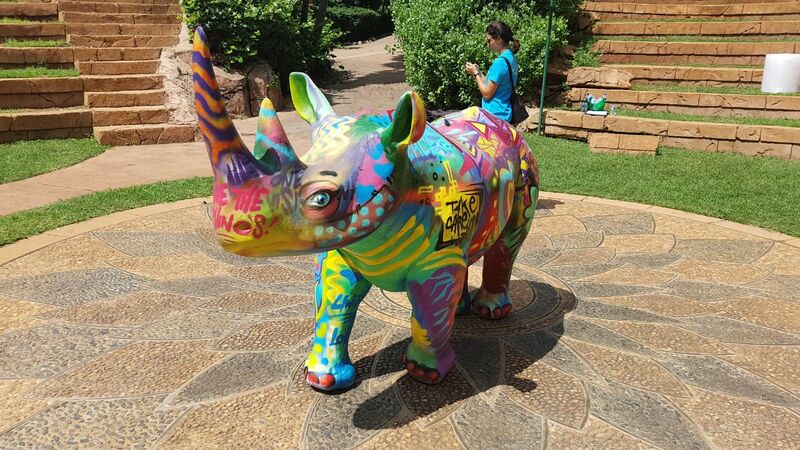 The fibre glass rhino was dedicated to the “Save the Rhino” campaign which addresses a huge problem facing South Africa and the world as a whole. As you might know, the rhino horn is one of the most sought-after products in the global black market where its price exceeds even that of gold. It is said to believe that an average of three rhinos are killed by poachers every day. Illegal trade is the biggest threat to the different species of rhinos and has driven some species such as the northern white rhino, to the brink of extinction. The death of the last surviving northern white rhino male, Sudan, which was being safe guarded in the Ol Pejeta reserve, Kenya, made headlines on the 19th of March 2018. It is now said to believe that the only way for the species to survive is with science and human intervention. The future of this species now lies in artificially assisted reproduction and vitro fertilisation techniques. Through this team building, we were able to raise awareness and incite thought provoking conversation concerning the “Save The Rhino” movement. That, alongside the physical getting-hands-on involvement of the group causes a sensory experience which we trust will lead to active activism. Once again through the effects of public art, we were able to bring to light serious societal issues and get those who participated to think about how they might contribute in the larger scheme of things. BAZ-ART Presents Shoprite’s CSI project. Baz-Art is a non-profit organisation dedicated to harnessing the power of art for the benefit of the public. We channel our energy and achieve our objectives through Art Creation, Education, Incorporation, and Development.